Reflecting on the impact his mother had on his life, Abraham Lincoln said, "All that I am, or hope to be, I owe to my angel mother." For so many, mothers are the formative figures who shape and guide their children. Surely that devotion is embedded in the mitochondrial DNA, transcending and informing future generations. In honor of Mother's Day, I celebrate my mother and her mother and those before her who instilled and nurtured an intense love for family. However, the ode to the maternal line stops abruptly with my third great-grandmother, Mary Jane (Andrus) Bair (pictured at far right). 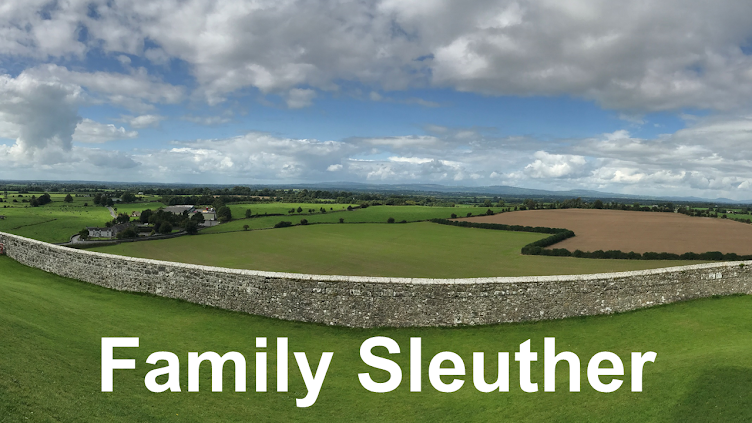 Featured in this blog's second post nearly three years ago (see Kindly Relatives Build a Brick Wall), Mary Jane's mother remains a mystery and represents a long-standing brick wall. Mary Jane was born in December 1862 in Bradford County, Pennsylvania. Her death certificate revealed her father was Jerome Andrus, but the mother was "unknown." 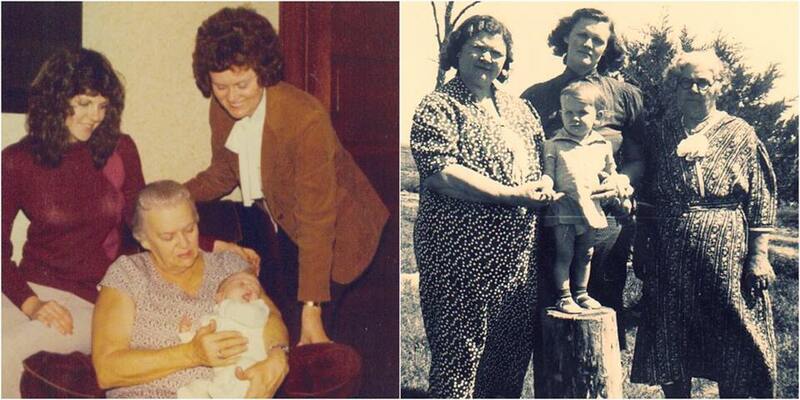 Mary Jane's obituary explained that her mother died when she was only three weeks old. For whatever reason, Jerome did not raise his daughter and she was left to "kindly relatives, Mr. and Mrs. Jared Beardsley, who adopted her as their own on January 3, 1863." Jared's wife was Elizabeth "Betsy" Andrus. 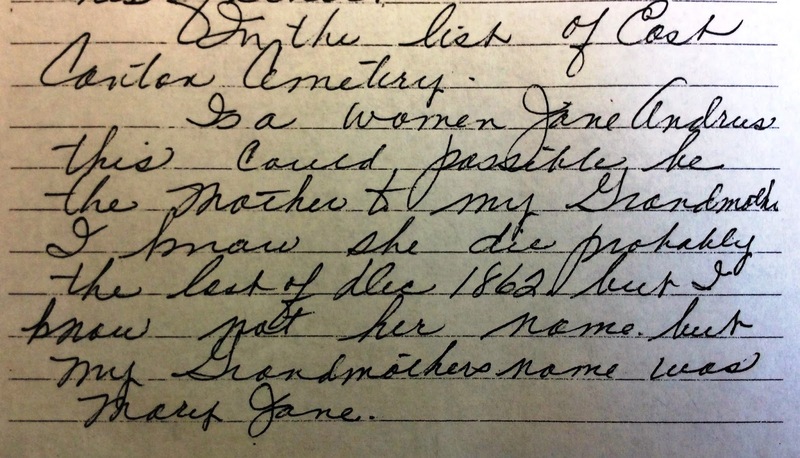 Failing to locate an obituary for the mysterious birth mother or any adoption record, I wrote to the Bradford County Historical Society to see if their archives held any answers. While there was no smoking gun, they did return to me photocopies of letters written to the Society by Leona Bair Kenney, a first cousin 3 times removed, who was a granddaughter of Mary Jane. Despite her closer proximity in time to Mary Jane, Leona was also searching for the unknown mother. In a May 1988 letter, Leona shared her speculation on the mother's possible identity. 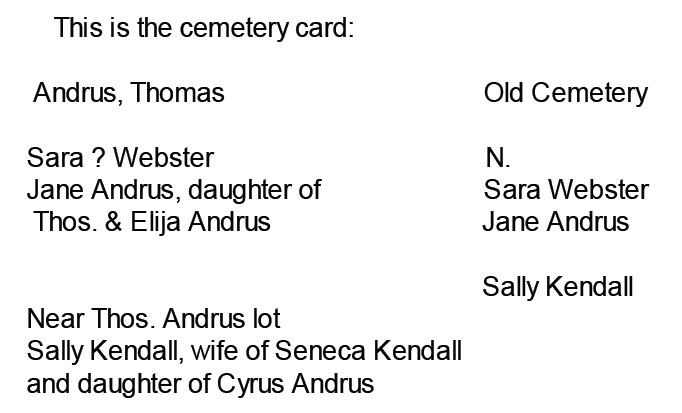 She had come across a census of burials in the East Canton Cemetery in Bradford County, which included a woman named Jane Andrus. Unfortunately, the headstone for this Jane Andrus no longer stood and was missing. Leona Bair Kenney letter to Bradford County Historical Society. I spoke with the cemetery's caretaker. He confirmed that there was a burial record for a Jane Andrus. However, the record did not include a burial date or age at death. It did suggest, though, that Jane was the daughter of Thomas and Elizabeth "Eliza" (Beardsley) Andrus. I was struck by the connection to the Beardsley name. 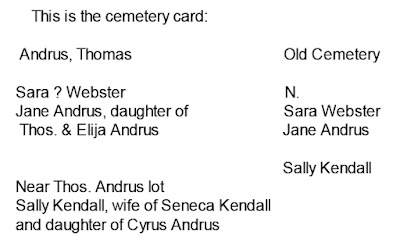 Also curious was that both Thomas and Eliza were buried in Nebraska where Darwin Andrus was buried. Darwin was father to Jerome - Mary Jane's father. 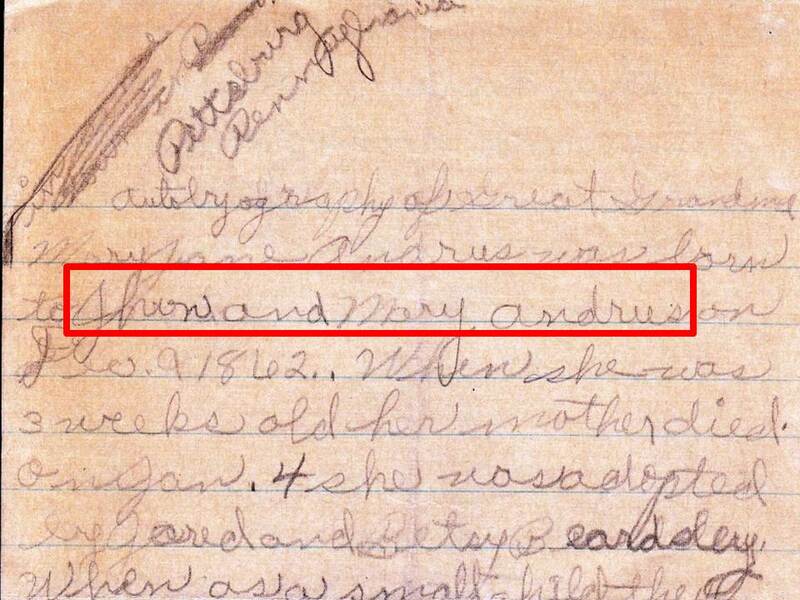 Leona's curiosity about this Jane Andrus seemed to center around her first name and the possibility that Mary Jane may have been named after her deceased mother. It's a fine theory, but the facts have yet to materialize in order to substantiate or disprove it. In October 2014, my maternal grandmother passed away. 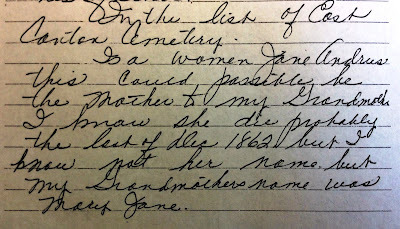 As the family cleaned out her home, a handwritten biography for Mary Jane was discovered tucked away in a filing cabinet. It looked as if it was written to inform Mary Jane's obituary who died in 1945. 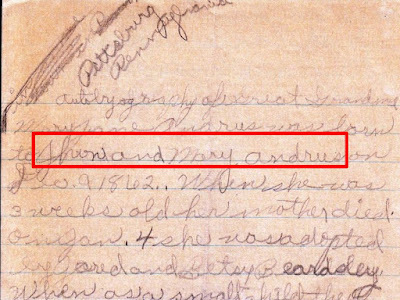 Curiously, the note said that, "Mary Jane Andrus was born to Jhon (sic) and Mary Andrus..." This was the first I time I had seen a name given for Mary Jane's birth mother. Who wrote the document? Why was Mary Jane's father given as "Jhon" instead of Jerome? Was this due to a lapse in memory? Regardless, it cast doubt on the certainty of the mother's name. Nonetheless, it's another clue that continues to direct this ongoing investigation. Perhaps a probate or adoption record will eventually surface and provide answers. Until then, I can't help but wonder what impact the loss of her birth mother had on Mary Jane. Did she ever know her mother's name? On Mother's Day, I'm left to wonder how the unknown matriarch - whether innately through her DNA or emotionally through her absence - shaped and influenced Mary Jane and subsequent generations of mothers.